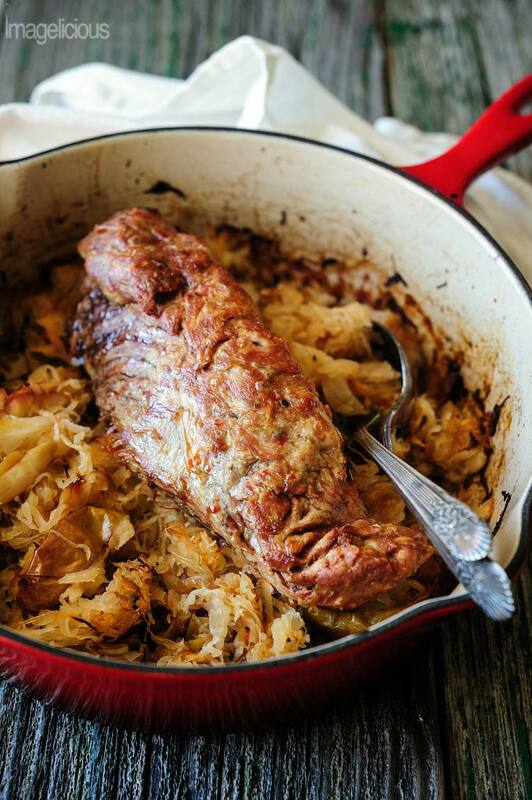 This Pork Loin with Sauerkraut and Apples is a great fall dish and easy to prepare after work. Perfect for weekday dinner or weekend entertaining. Cooking with meat now is a much different affair than it was before the baby. I always liked simple recipes where meat was roasted or braised and didn’t require much supervision, but I still cooked more involved dishes too: chicken thighs stuffed with ricotta and baked (this recipe is now featured in my cookbook, The Ultimate One-Pan Oven Cookbook), thin pork schnitzels (also in my cookbook), healthy chicken stew – all easy, but all requiring some degree of preparation and time. Time is luxury now. Uninterrupted time is a unicorn. 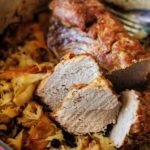 This Pork Loin with Sauerkraut and Apples recipe is really simple, hearty, flavourful, delicious and quick to prepare before the pot goes in the oven to finish cooking. It is so good that a variation of this recipe is also included in my cookbook. What is the inspiration for Pork Loin with Sauerkraut and Apples recipe? It’s inspired by the famous Alsatian dish called Choucroute garnie – various kinds of pork sausages, pork chops and bacon cooked together with sauerkraut, onion, garlic, juniper berries and often served with potatoes. Just like with Russian borscht there’s no set recipe for Choucroute garnie. I had it a few times at restaurants and even made it myself many years ago. What are the ingredients for Pork Loin with Sauerkraut and Apples? I have a soft spot for sauerkraut, although Russian version is quite different as it is lacto-fermented. My husband, being of Dutch descent, also loves sauerkraut, potatoes and sausage combo. So, when I saw a package of two jars of sauerkraut at an incredible price at Costco a few months ago I grabbed it right away (in case if you haven’t noticed, I’m a Costco addict). Those jars were waiting in my pantry for a while and then I had a pork loin leftover from a package of four (also curtesy of Costco) in my fridge as well as a couple of apples (leftover from these Apple Pie Rolls) and all these ingredients melded beautifully. You could use pork tenderloin but you would need to decrease cooking time as pork tenderloin is thinner and it’ll cook faster. You would also want to use two tenderloins. McIntosh if you’d like the apples to melt into the sauerkraut. Honeycrisp if you’d like the apples to stay in pieces. You can use regular cooking onion, sweet onion, red onion, or even shallots. Find the kind you like but I prefer the german kind, not the lacto-fermented kind for this recipe. Juniper berries are technically essential in the flavouring of Pork and sauerkraut if you’d like to follow the traditional flavours but technically they could be omitted. They add a beautiful peppery flavour to the dish so you could also use whole peppercorns. Make sure to remove the juniper berries from the cooked dish as they are pretty harsh if bitten into. I don’t drink much but I always have Vermouth in my pantry for cooking. It has a wonderful savoury flavour that is just perfect for deglazing. Also, unlike wine, it can keep for years once open. You can use white wine or chicken broth instead. 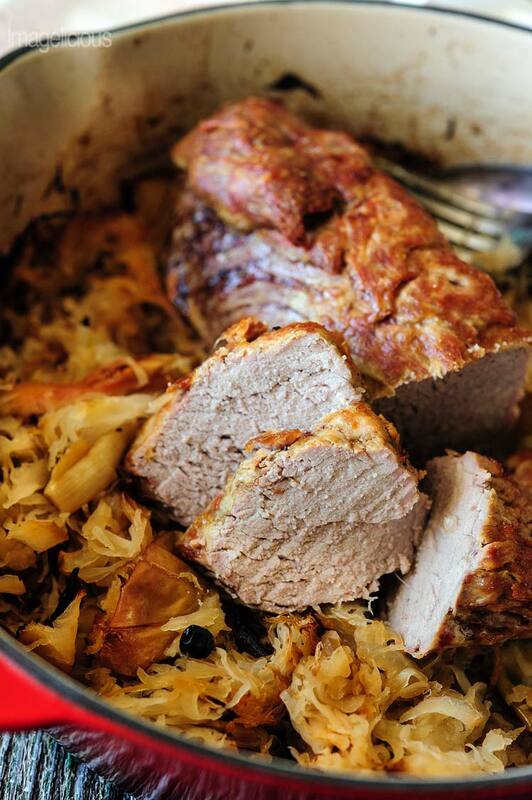 This Pork Loin with Sauerkraut and Apples recipe just came together easily and turned out absolutely delicious. It is a tiny bit more involved then a few of my previous posts, but not much, preparation time is about 10-15 minutes only and then a few minutes cleanup. The one step that I don’t like that takes extra time but I recommend not skipping is searing the pork loin. It really adds a nice flavour and texture to the meat, but in a pinch it could technically be skipped. While the loin is sizzling in the pan you need to slice an onion and a few apples, no need to be precise there as they will melt into the sauerkraut while cooking in the oven. Once the pork is golden on all sides, transfer it to a plate, add the onions and apples to the pan and cook for a few minutes until softened. Splash some vermouth to deglaze the pan then add drained sauerkraut, a few cloves of garlic and a handful of juniper berries; rest the pork loin on top and transfer the whole pan to the oven where sauerkraut and apples will mingle together with the pork juices. My oven is really weird and it always takes much longer to cook and bake, so please adjust cooking time to your oven. It took a little bit over 1.5 hours for my 3 pound pork loin to cook. Depending on your oven and the size of the pork loin it could take less time, so I’d start checking after an hour. Internal temperature should be between 145 to 160F. I always err on the side of caution and cook to 160F. Season pork with salt and pepper if using (I only used pepper as sauerkraut is salty enough for me). In a large ovenproof pan (I used dutch oven) heat 1 tablespoon of olive oil, add pork loin and sear in all sides for about 3-5 minutes. Transfer pork to a plate. While pork is searing, slice an onion, core apples and slice in wedges, peel garlic and drain sauerkraut. Add another tablespoon of oil to the pan. Add onions and apples. Sauté for about 5-7 minutes until softened and onions are slightly browned. Add vermouth to deglaze the pan and cook for a minute. Add drained sauerkraut, garlic and juniper berries to the pan and mix. Place seared pork loin on top and transfer the pan to the oven. Cook for 1- 1.5 hours until pork is cooked through to 145-160F. I really like combination of savoury and sweet, so I love apples in this recipe. I find they add a nice touch of sweetness to briny sauerkraut. To be honest, I would use more apples, maybe about 4 small apples in this recipe instead of 2 listed above, but my husband isn't a fan of salty and sweet together, so I used fewer apples that I would like. Juniper berries add a slight peppery tang to the recipe as well. They are traditional addition to Chacroute Garnie, so I added them here too. If you don't have Juniper berries, I wouldn't go crazy trying to find them, I'd use a few peppercorns instead. You don't have to use vermouth to deglaze the pan. White wine or even chicken stock are a good substitute. You can even use just water too. I love using vermouth in savoury dishes, it adds a little depth of flavour and rounds up the food nicely with its earthy and grassy tones. I rarely have a bottle of wine opened just waiting for the deglazing and I wouldn't open a bottle if I only needed a quarter cup, but vermouth is perfect for it as it keeps for a long time and frankly has more flavour than white wine. Where did you get juniper berries????? When it’s in the oven, do you cover the pot? That’s a good question. I should update the recipe. No need to cover the pan initially. Cover only if the top is starting to burn and it’s not cooked through yet which depends on your oven. What are the best apples for baking? There are so many varieties! I honestly use whatever I have in my pantry. I love using Gala, Ambrosia or Golden Delicious. 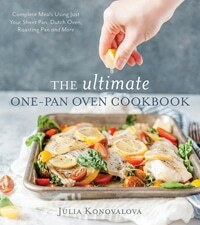 Julia this looks insanely delicious! I love the crispy exterior of the meat and the use of juniper berries! Highly underused flavour booster. And, you’re hilarious. I totally didn’t know you were addicted to Costco! Good thing as they have some decent prices on diapers … which reminds me that I need to go there.